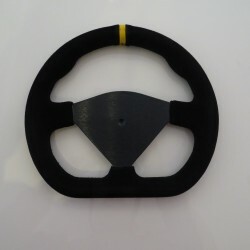 Stylish Formula D Type Steering Wheels By Rmd, Waterproof Suede Type Finish, Yellow Marker Stripe For Top Of Wheel. Available In 10", 11" & 13" To Fit Sparco, Omp, Momo & Mountney - M Type Steering Wheel Bosses & With Blank Undrilled Centre In 10"
Suede finish steering wheel by RMD 10" or 255mm. Ideal for kitcar, race car or custom build. 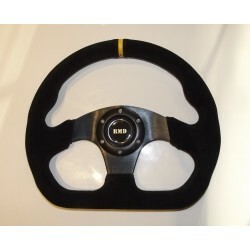 Also av..
Suede finish steering wheel by RMD 10" or 255mm. Blank undrilled centre with centre spot. 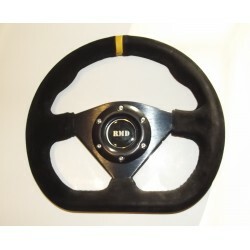 Ideal..
Suede finish steering wheel by RMD 11" or 285mm. 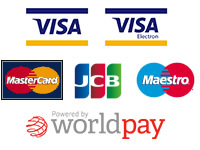 Ideal for kitcar, race car or custom build. 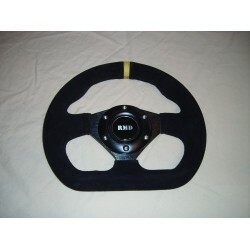 Also av..
Suede finish steering wheel by RMD 11" or 255mm. Blank undrilled centre with centre spot. 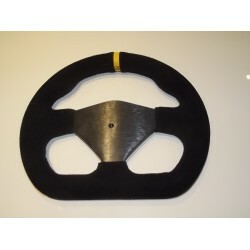 Ideal for ..
Suede finish steering wheel by RMD 13" or 320mm. Ideal for kitcar, race car or custom build. Also av..
Suede finish D shape steering wheel by RMD 10" or 255mm This wheel has a carbon finish, see our ..
Suede finish D shape steering wheel 11" or 285mm with 6 hole boss mounting This wheel has a carb..
Suede finish D shape steering wheel 13" or 320mm 6 hole boss mounting This wheel has a Carbon fi..